Now this is the tricky part for the small scale home maltster but I’ve recently discovered that the amount of malt used vs. the container size is very important, otherwise you may not reach 50C or it may take a long time, like 3 days. I’ve tried different amounts for different lengths of time in different coolers and containers and I’ve found that 10 lbs in a 5 gallon cooler works perfectly. The cooler mimics the conditions of a larger pile of malt. Interestingly this technique is mentioned in the London and Country Brewer of 1736 in Chapter 2. “Now when it is at this degree and fit for the Kiln, it is often practised to put it into a Heap and let it lye twelve Hours before it is turned, to heat and mellow, which will much improve the Malt if it is done with moderation, and after that time it must be turned every six Hours during twenty four; but if it is overheated, it will become like Grease and be spoiled, or at least cause the Drink to be unwholsome” Also in this text is this description of the malt near the end of germination: “and when it is fixed and the Root begins to be dead, then it must be thickened again and carefully kept often turned and work’d, that the growing of the Root may not revive,” This quote describes the withering of the roots which is more evident with traditional longer germinations. Purposely withering the malt on the floor was also a common practice when floor malting and this was done by spreading out the malt to a very thin layer of 1 or 2 inches. Just for fun I thought I’d try drying out the malt a little by spreading it out to see if using a somewhat dryer malt had an effect on this process. I was thinking that this hot couching process might be the way to add more colour to my diastatic brown malt. Unfortunately, when the malt has undergone a long traditional germination or has been withered the moisture content will be lower, 27% in my case. I believe that with a lower moisture content the proteolytic enzymes are not as effective as a malt with a higher moisture content when the temperature rises. I’ve created dark malts before by stewing the malt in my kiln at 50C immediately after germination. 16 hours of stewing seems like the magic number and then drying and kilning as you would for a pale malt. But I wanted to see if I could get a very dark malt naturally with this hot couching method instead of stewing it in my kiln. The second batch uses the same Skagit Valley barley as the first one given to me by Skagit Valley Malting. 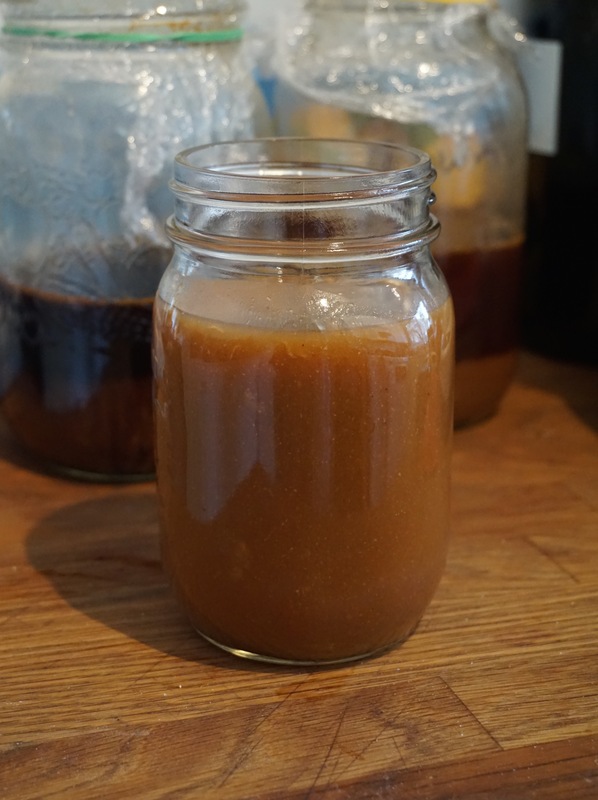 Both started with a 46% moisture content using 8 hour steeps and 8-12 hour rests. 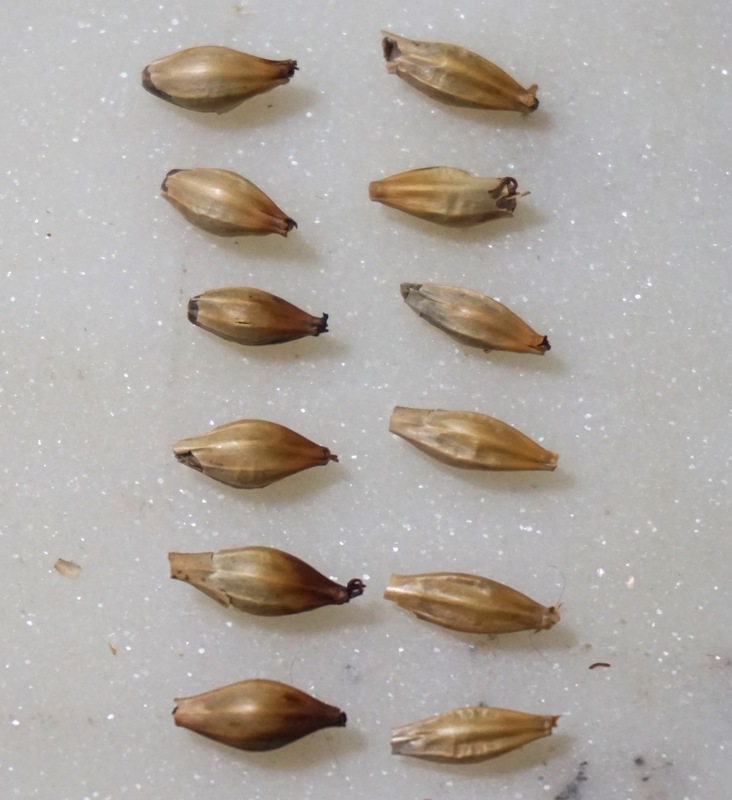 Both were well modified with acrospires reaching the full length of the grain having germinated at roughly the same temperature. 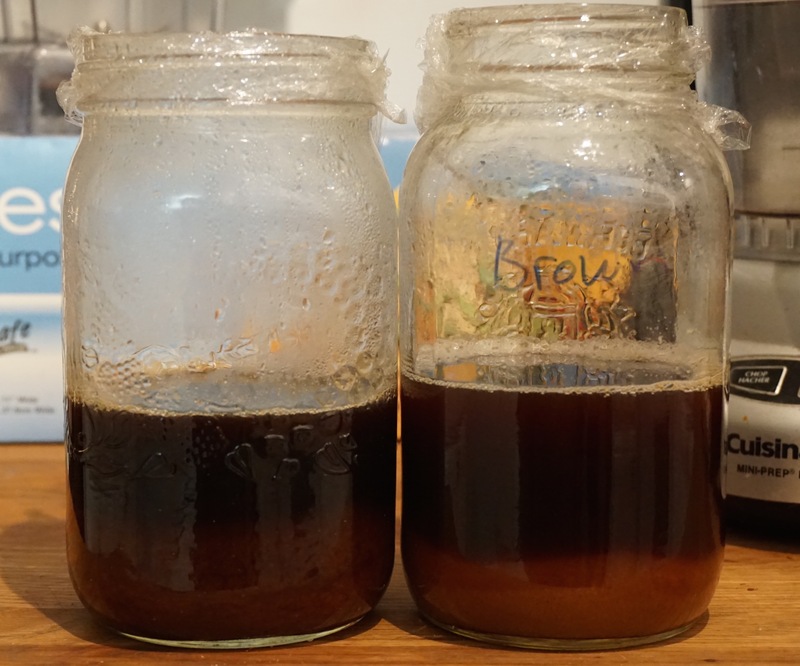 The only difference is that the first batch withered for 28 hours before being put in the cooler. To wither I simply spread it out to an inch depth on window screens with space under the screens for air-flow. After withering it had a moisture content of 27.5% whereas the un-withered batch had a moisture content of 40%. The first batch reached 51 C, its maximum temperature, after 32 hours in the cooler. The malt was covered loosely with dish towels for insulation but allows for some oxygen. (I’ve tried it with an airtight lid but it doesn’t work) I then let it cool down for another 16 hours, for 48 hours total. When I took it out the temperature was at 47 C. It then went in the kiln to dry at 65 C (air on temp). The second batch went into the cooler at 40% moisture having gone through the same germination regime minus the wilting. It was a little faster and reached 51C right around 24 hours, just like the textbook says! I then let it cool down to 45 C for a total of 39 hours in the cooler. This malt was then dried for 12 hours under 50C which also makes a difference due to the fact that the enzymes are still active during this time especially at the beginning. There’s huge difference in colour due to the difference in moisture content at this “hot couch” stewing phase. Not only are the enzymes more effective with more moisture but continue their activity during the longer drying phase after the “hot couch”. Perhaps if a traditional floor malt was not as dry as my “wilted” malt that this method played a role in adding colour to the diastatic brown malt of the past. 4 hours at 205 F 3 hours 65 C (Air on temp) 55 malt temp. 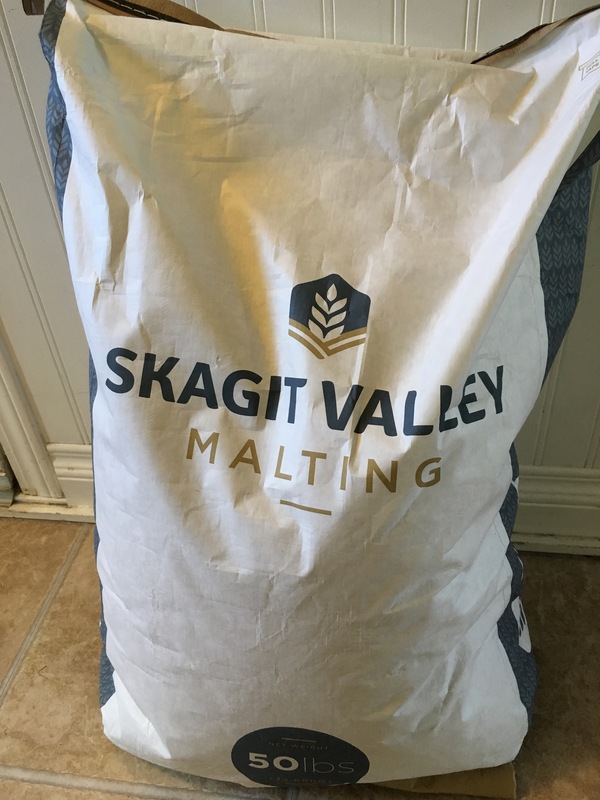 I’ve been wanting to visit the Skagit Valley Malting facility for a while, mostly because it’s only an hour and a half away from where I live. 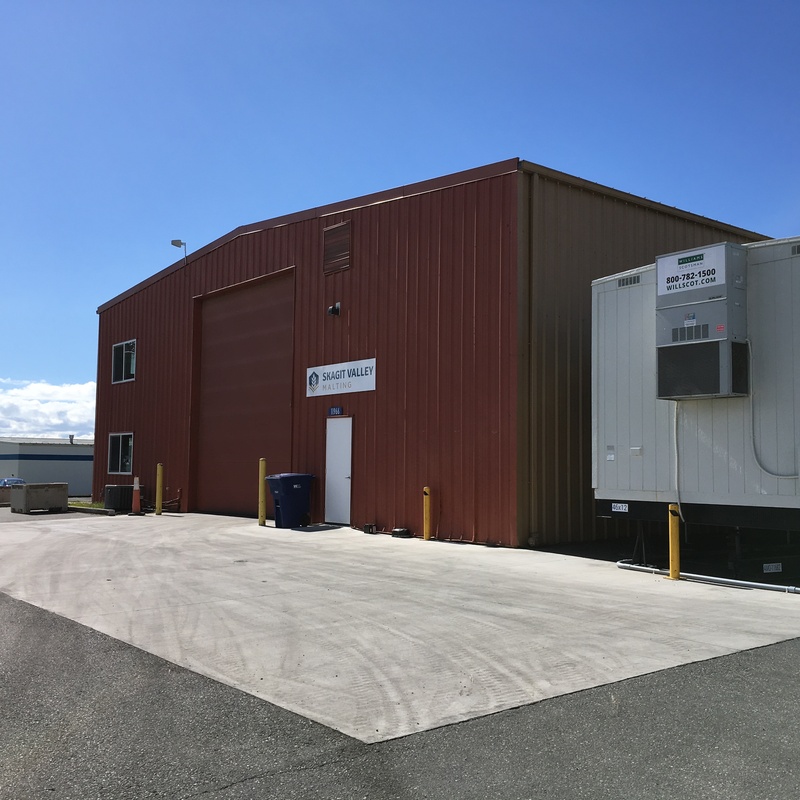 In a relatively short time span, they’ve expanded to the point where this year they will be able to store 12 million pounds of grain in their silos. They’ve got quite a few videos on their website FAQ section describing their operation if you haven’t seen them already they’re worth a look. They’re also on Facebook where you can see lots of video footage and photos. What I think is very cool about this place is they’re malting locally grown grain, all grown within 12 miles (except for some organic grain which is grown in Delta B.C. which is literally a stone’s throw away from my garden!). 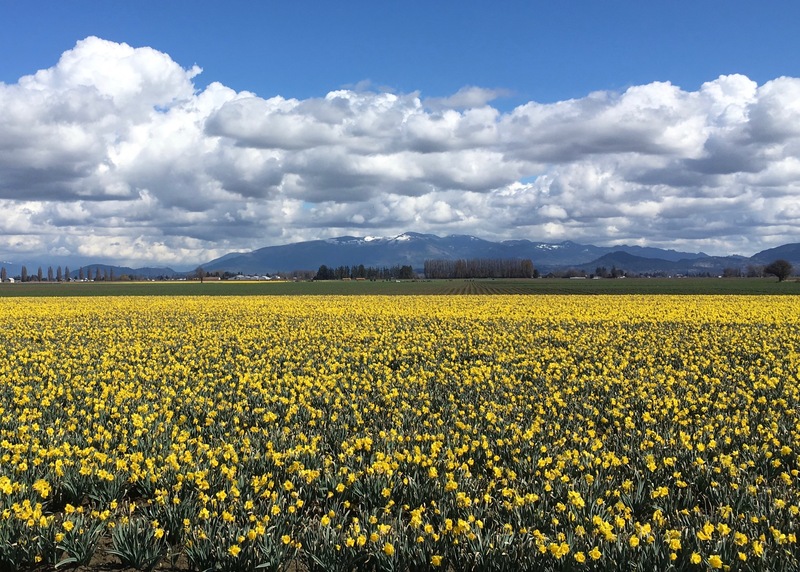 The Skagit Valley is mostly known for it’s seed and tulip bulb production. Most of the barley grown here used to go to the commodity feed market. 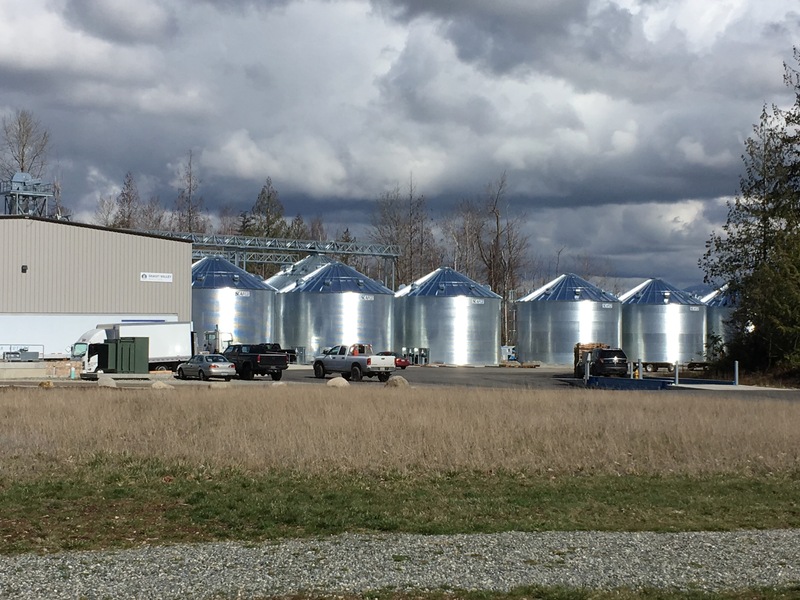 Now Skagit Valley Malting gives local farmers a new and better market opportunity. As it turns out because of the temperate summers this area is very well suited to grow barley and since they buy the grain directly from the growers they can work together to select and grow the best malting varieties for the area. They’re planning to fill this space with more vessels. On the right side is the original pilot vessel which is now used for test batches. Diastatic brown malt is a dark malt kilned over a fire fueled with coal, wood or straw which has enough diastatic power to convert itself. 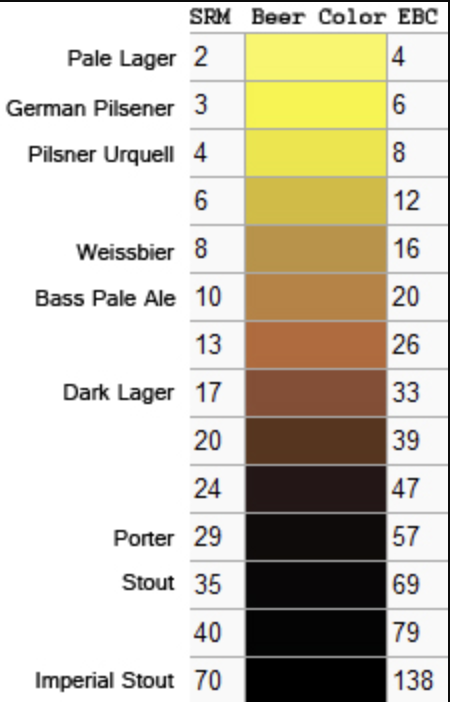 Made during a time before the widespread use of thermometers and hydrometers the colours and level of diastatic power would have varied between maltsters. An essential source of information on malts of this time comes from the London and Country Brewer by William Ellis published in 1736. Times for kilning malts is described as being either 4, 6 or 12 hours with the “pale sort” requiring “more leisure and less fire than the amber or brown sorts” But is it really that simple? In my previous attempts to make diastatic brown malt a couple of years ago I didn’t think I was successful in answering the question that has been bugging me since the first time I read the London and Country Brewer and that is; how was malt dried in 4 hours with high heat, able to maintain some diastatic power, since enzymes are destroyed very rapidly over 221°F. 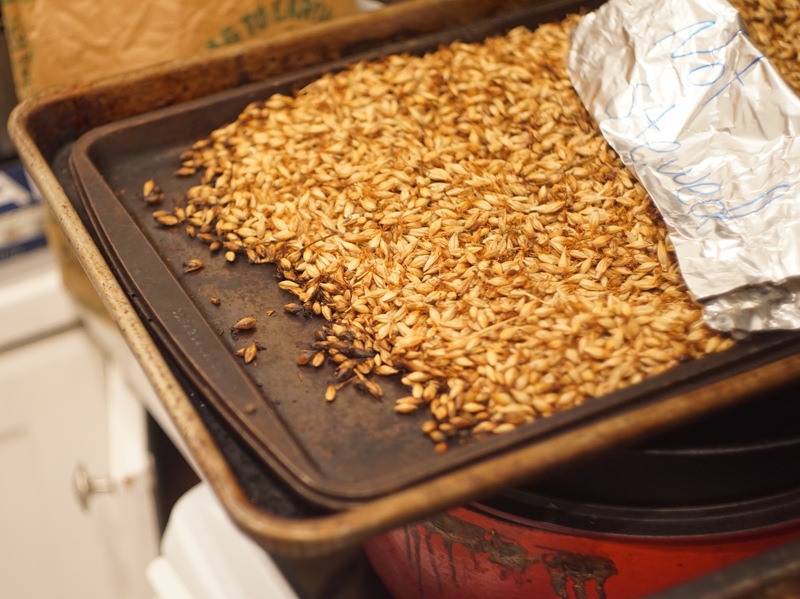 Modern brown malt is kilned at a high temperature, 350°F from it’s green stage, right after germination. It will not have any diastatic power. 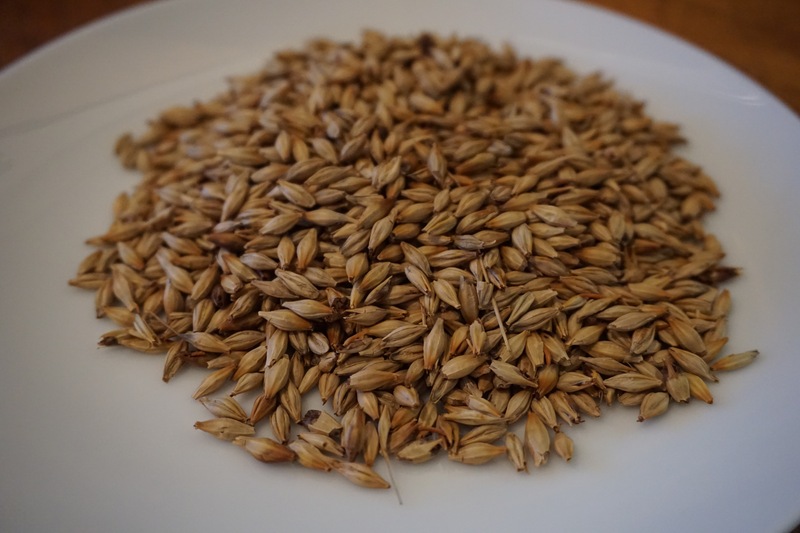 We do know that brown malt did not have the same diastatic power as pale from the description of kilning brown malt. “…is often crusted and burnt, that the farinous part losses a great deal of it’s essential Salts and vital Property, which frequently deceives it’s ignorant brewer, that hopes to draw as much Drink from a quarter of this, as he does from pale or amber sorts” (pg.14). What we don’t know are the kilning temperatures. Some 70 years after this publication a study of brewing industry practices was carried out to determine if Bere barley grown in Scotland should be taxed at the same rate as English barley. 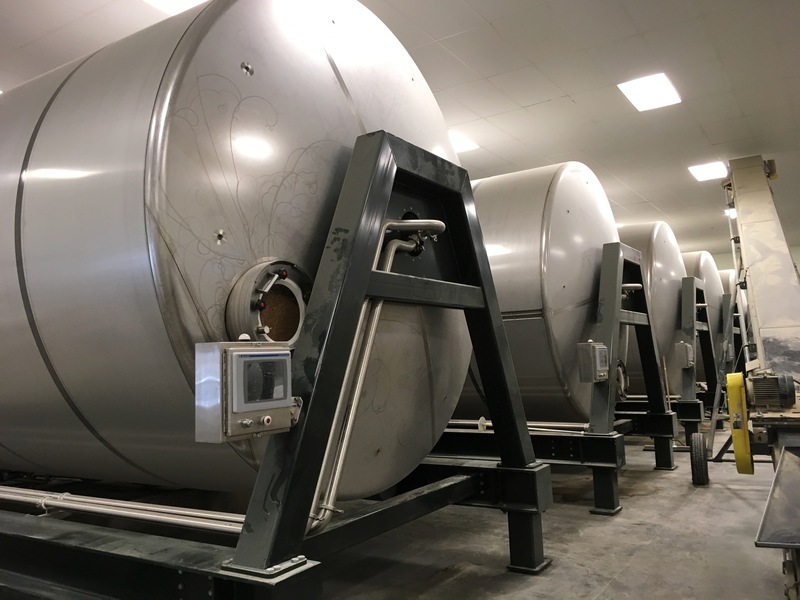 The Scotch Bigg Report (Thomas, Coventry and Hope) presented to the British Parliament in 1806 contains some of the earliest empirical data on brewing and malting collected on a large scale and includes kilning temperatures. This report also pre-dates the development of Black Patent malt (1817). Malts were still referred to at this time as either pale, amber and brown. What I found very surprising in this report is that a temperature of 170°F is given for brown malt which is the same curing temperature for pale malt. “Malt may be made brown at a lower temperature for it is not so much the temperature, as the suddenness with which it raised, while the malt is still moist, which alters the colour.” Pg. 33 However, they also recorded some maltsters kilning at temperatures of 186°F and suspected some kilned as high as 212°F. So how does it get dark? 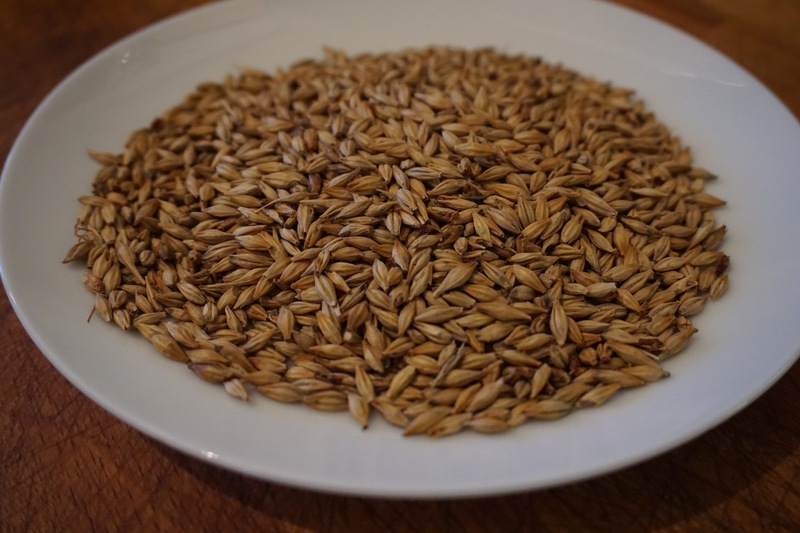 With Munich malt temperatures are raised while there is 20-25% moisture in the malt causing a partial caramelization and it is more highly modified which encourages melanoidin formation upon kilning making a darker malt. It’s also kilned at a higher temperature as well but even Aromatic malt is not as dark as I would imagine a porter being at the time. In my experiments trying to make brumalt I somewhat accidentally achieved a very dark malt by stewing the malt in the proteolytic temperature range of 44-59°C or 113-138°F. 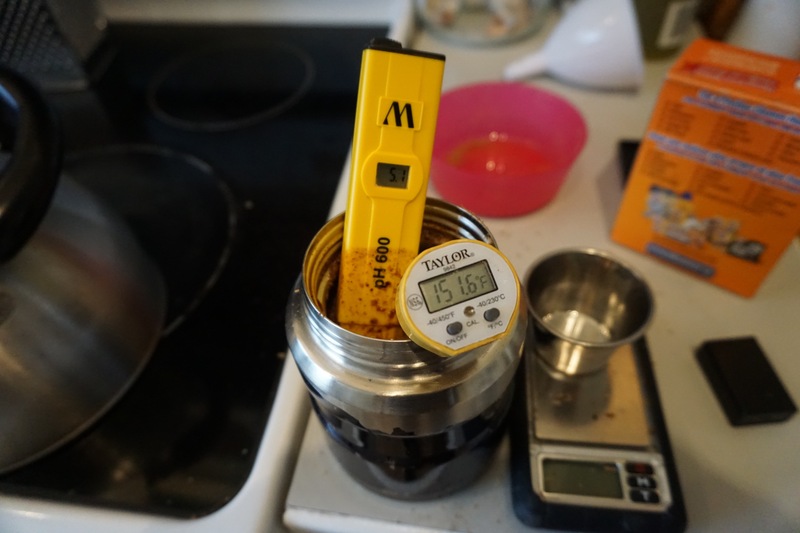 So I looked for some clues to see if there was something in the older methods of malting that would promote more Maillard reactions, perhaps if using traditional methods the malt would darken to a greater degree. Lastly, I recently bought a copy of La Practique du Maltage Lucien Levy 1898 and there is a kilning schedule for “Malt Anglais” which states. “It rises as fast as possible to 50 ° (malt temperature and not air). We stay there for about twelve hours.” (Translated from French) It then goes up to 60 for another 12 hours. Interesting! lots of time for proteolytic enzyme activity here especially if it raised to 50° with a high moisture content. However this is not mentioned in the Scotch Bigg report but it does say that kilning takes anywhere from 40-80 hours and that the starting temperature is usually the same as body temperature which is 37°C. With such long kilnings it wouldn’t surprise me that the malt would spend a considerable amount of that time leading up to 50°C and that there would be a lot of enzyme activity during this initial kilning. 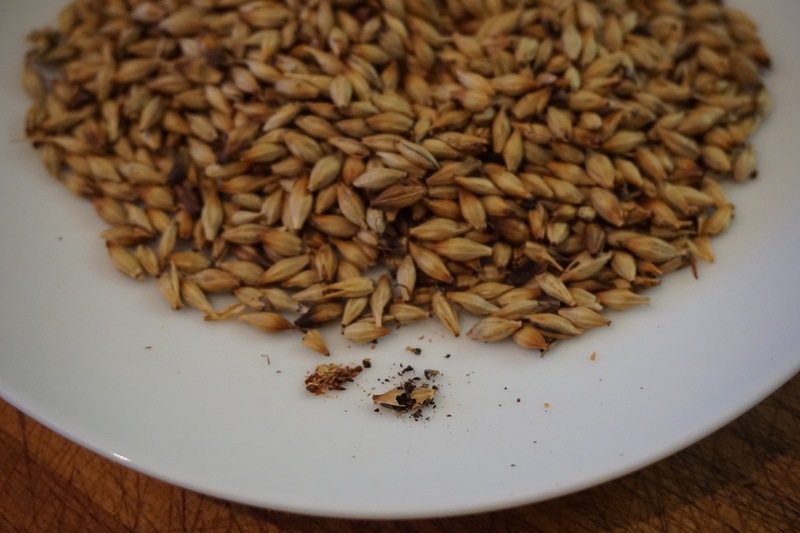 In the London and Country Brewer of 1736 a distinction is made between malt that is “blown” and brown malt. On the subject of frames, or the materials used for the kiln floor it states “the Iron and Tyled one, were chiefly Invented for drying of brown Malts and saving of Fuel, for these when they come to be thorough hot will make the Corns crack and jump by the Fierceness of their Heat, so that they will be roasted or scorch’d in a little time, and after they are off the Kiln, to plump the Body of the Corn and make it take the Eye, [ What I believe “take the eye” means is that it will simply look better by increasing in volume. In Wigneys 1823 Philosophical Treatise of Malting and Brewing he describes the effect of sprinkling as “giving to the malt a plump, fair appearance to the eye…” ] Some will sprinkle Water over it that it may meet with better Market. (Malt was sold by volume) But if such malt is not used quickly, it will slacken and lose it’s Spirits to a great Degree, and perhaps in half a year or less may be taken by the Whools (a small insect) and spoiled: Such hasty dryings or scorchings are also apt to bitter the Malt by burning it’s skin, and therefore these Kilns are not so much used now as formerly” This is a criticism of surfaces that conduct or retain too much heat. What he is describing is “blown malt” although he does not refer to it as such. Corns that “crack and jump” and expand in size will occur when temperatures are high and the moisture inside the grain cannot escape fast enough. Most recipes for Blown malt after Black Patent malt comes into use refer to it as simply Brown or Porter malt. All the recipes I’ve read dry the malt to a certain degree first. In Brewing and Distillation by Thomas Thompson and William Stewart (1848) “Brown or Porter malt is dried by applying the same heat at first as to pale malt, and after it is half dried, by blowing it (as it is termed) on the kiln. This is done by raising the heat as high as the men who turn it on the kiln can possibly stand. This may be stated at 200° for the first turning, and higher afterwards.” The same thing is stated 50 years later in La Practique Du Maltage: The brown malt or blown is obtained as follows: We take malt half kilned and we carry it in a second kiln heated with a large fire of oak or beech it is installed in layers of 3-4 centimeters. What also encourages this popping effect is the shrinkage of the pores of the husk which occurs after the “free drying” stage of kilning which happens at around 23% moisture. So if the temperature is raised very rapidly at this point the steam formed will not be able to escape fast enough and the kernel will pop. I suspect the sprinkling of water can increase the malt temperature faster by adding steam to the malt bed. I decided not to try sprinkling water on mine. 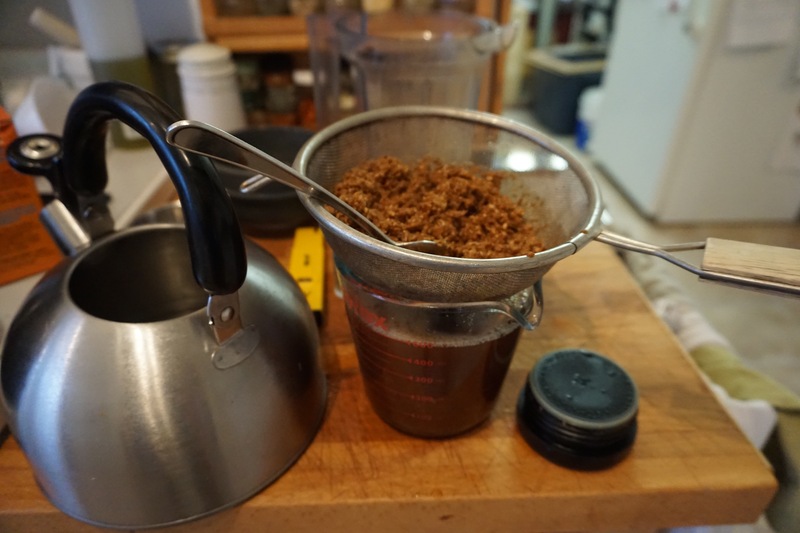 This time I just wanted to try drying the malt down below 30% and subjecting it to a high heat, above 212°F. I put it in the oven at 350°F which may have been overkill but it sure popped! It sounded sort of like popcorn when it really got going after 20 minutes at this temperature. Hot couch 36 hours in an open cooler to mimic a larger amount of malt. Temp. reached 39°C Turned after 12 hours then every 6.
kilned another hour and a half at 205°F moisture down to 6% Colour was light! Malt #2 Hot couch, no stew and 8 hrs. at 205-210. 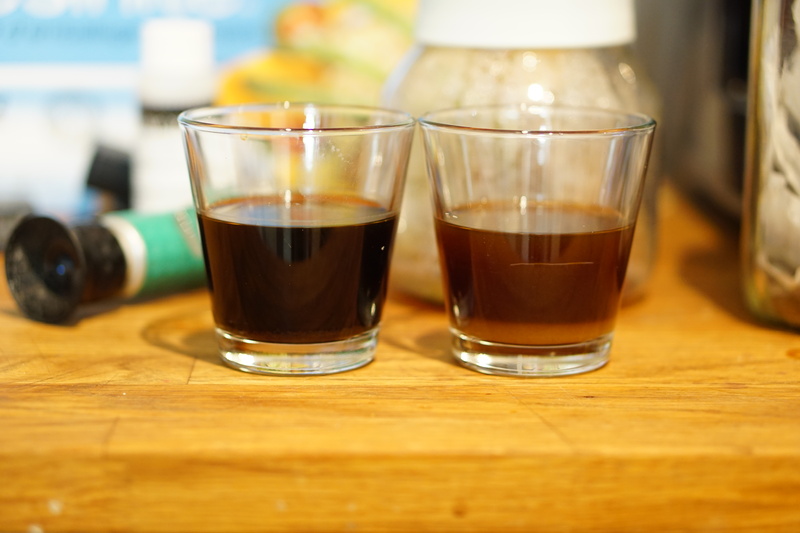 Observations: When comparing the Blown malt to malt #1 the colour is almost the same. I was really excited to see how dark #1 got. Much darker than my previous attempts at Brown malt. Because malt #2 remained light, even after 8 hours kilning, it’s safe to attribute the darkness in colour in malt #1 to the limited stewing phase at 50°C. I ran them all through a mini-mash at 152°F pH adjusted to 5.2 (or as close as possible with a little baking soda or some acid malt) for one hour. I was not using the standardized congress mash, instead, I was using a scaled down version as if I were brewing a 5 gallon batch with 10lb of malt only I was using 4 oz of malt. The math may have gone a little sideways but as long as it was the same for each I thought it would make an interesting comparison. Of course #1 had the highest brix at 9° and the blown had the lowest at 7°. I was pretty surprised to see that Malt #2 had some diastatic power at 8°. As a control I made another mini-mash the same way with a pale malt and it also scored a 9°. Mash #2 which did not have the initial lower temperature kilning remained a gloopy mass and the mash did not separate from the wort. This was not surprising as the beta glucans had not been broken down which may show the importance of the enzyme activity during kilning below 50°C 122°F or more specifically in the 37-45°C 98-113°F range . Malt #2 after mashing notice the lack of separation of wort. Malt #2 after 5 1/2 hours kilning at 205°F and still light. The flavour of the Blown was bitter and slightly charry like a roasted malt. The interior of some of the kernals was charred while the exterior looked a nice light brown with some darker areas. Malt #1 tasted great nice and malty. As for volume the malt was divided by weight before kilning. After kilning Malt #1 measured 4 1/2 cups. The Blown was 5 cups, a difference of 10% Perhaps it would have been more had I sprayed some water on it during kilning. I know I’ll get a lot of people questioning my methods here they’re not the most scientific, but I think it answered some questions in my mind about the effects of using a proteolytic stewing (or a slow kilning) phase. Also I think it’s safe to say that by omitting any initial drying or even withering phase the London and Country Brewer article has an oversimplified version of the kilning process. That may have been obvious to a lot of people but I know it has caused a lot of debate amongst others. 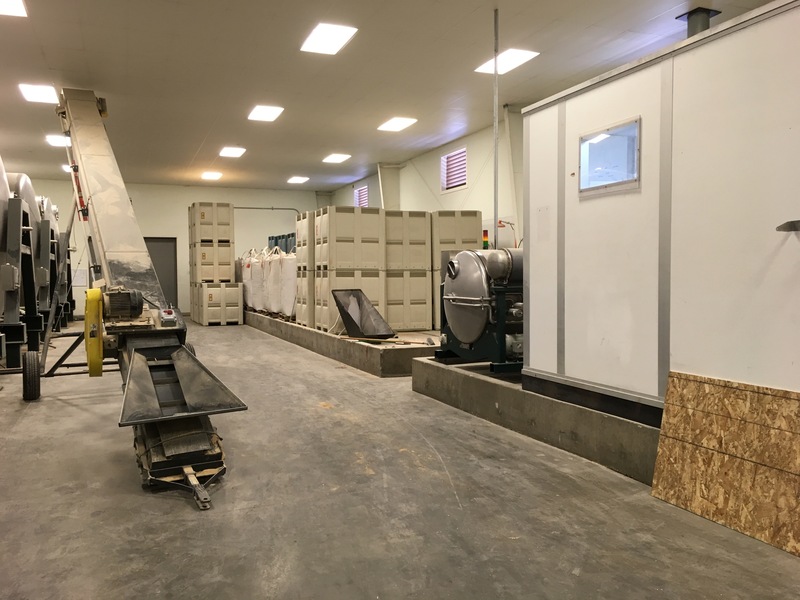 What I’d like to try is kilning at a lower temperature and raising the temperature when the moisture content is lower around 20%. 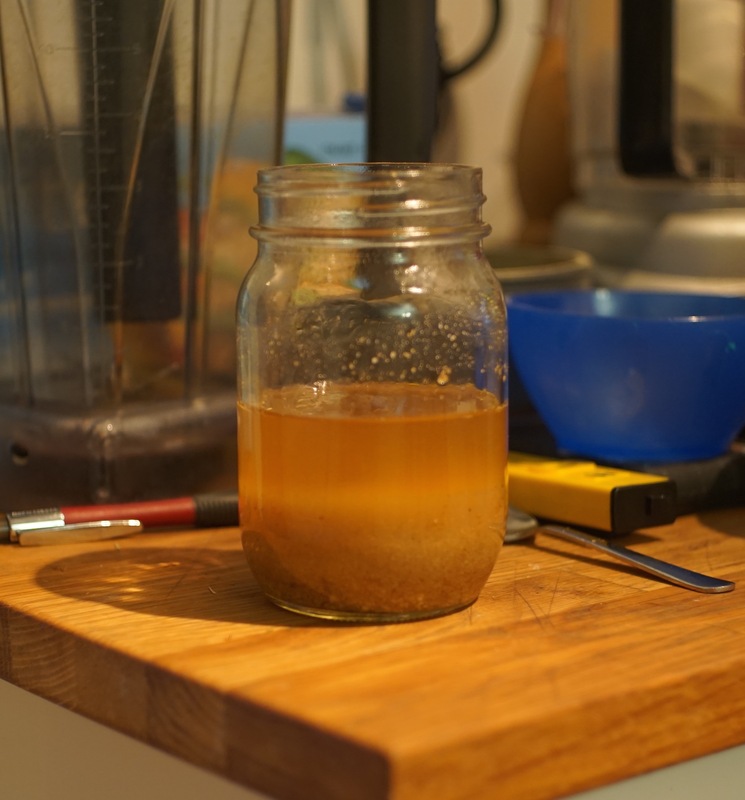 I’ also like to try making a blown malt at 200-250°F which is where I observed some popping happening during my first attempts at brown malt as I think this may be more historically accurate. But first I think I’ll make a much larger batch for a more historically accurate porter and perhaps this time I’ll get to play with some fire! Many thanks to Melanie and Andrew at McInnes Farms for supplying me with a big sack of Newdale barley grown 10 minutes away from where I live. These experiments and many more to come will be done with this barley.